A Lincoln writer is preparing to launch a new book, filled with short stories and poems of his life in Lincoln and beyond. David Zelder is best known for his 2011 novel, Yomping Outside. However his new book takes its inspiration from years enjoying the sites of Lincoln while sailing the River Witham, and trips further afield. Close Observations, which releases this November, is a collection of work described as ‘semi-autobiographical’ by David Zelder. 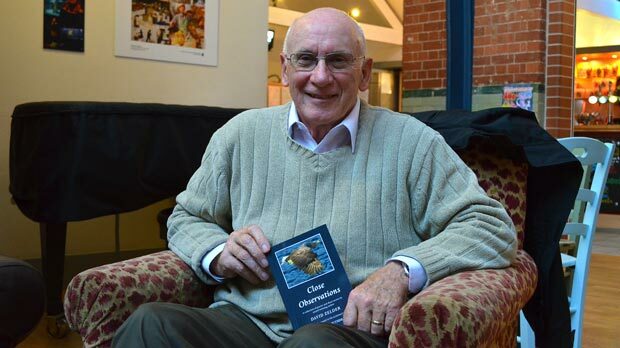 “The stories catalogue distinct points throughout my childhood, my travels and life in Lincoln”, said David. Among the short stories in the new publication, readers can enjoy tales with notorious Lincoln backdrops. The poem Screams over the Ribbon of Light paints a colourful picture of scenes of Lincoln’s River Witham. Zelder writes of “peace, tranquility” and the “idyll that is Lincoln”. Zelder captures characters close to many. The Red Arrows make an appearance, landscapes are recreated with a clear fondness, and wildlife poses as a vibrant motif throughout. “My wife and I get out on the boat regularly. I find the more I write, the more I observe life with a keen eye. Take the beautiful Sea Eagle on the front cover, which I photographed in Norway – the bird came so close her wings actually brushed my face. “Almost all of the works in this book come from real life situations. I am particularly proud of the poem Childish Art, which tells the true story of a picture I created on a train with condensation, using only a comb as my tool. It even got a round of applause. Before retiring, David Zelder worked as a CEO of a large PLC. After many years of research into self-publishing he has enjoyed writing, and won three awards for his short stories. In addition, David offers professional speaking services to clients such as major writing groups. “Any moderately intelligent person can write a book, but it takes a genius to sell one”, he says. “It has been a challenging journey, I have learned my learned many lessons and met some ‘vanity publishers’ in the process. “It’s great to be a part of Lincoln’s art scene. It makes my blood boil when people say there is nothing to do here. You have got to open your eyes, and that’s what Close Observations is all about. Close Observations and Zelder’s earlier publication Yomping Outside can be purchased on his website.